WAIKIKI, Oahu, Hawaii- - December 22, 2008 - Hilton Grand Vacations is pleased to announce the opening of its newest Hawaii property, the Grand Waikikian. As a landmark addition to the world-famous Hilton Hawaiian Village® Beach Resort & Spa, the all-suite resort will primarily accommodate owners and provide rental suites to visitors seeking residential-style accommodations. The 331-unit, all-suite Grand Waikikian™ by Hilton Grand Vacations Club® is the company’s fifth timeshare development in Hawaii. It joins the existing 236-unit Lagoon Tower and 72-unit Kalia Tower at the Hilton Hawaiian Village on Oahu, as well as the 120-unit Hilton Grand Vacations Club at Waikoloa Beach Resort and recently opened 198-unit Kings’ Land by Hilton Grand Vacations Club®, both located on the Big Island of Hawaii. 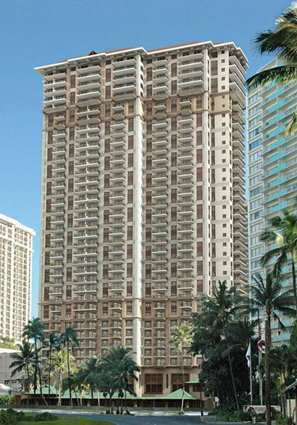 The 38-story Grand Waikikian evokes the ambiance of a grand hotel, while offering the amenities and comforts of a world-class resort condominium. The resort features luxurious one-, two- and three-bedroom suites designed with serenity and space in mind, including five floors of designated penthouses that offer spectacular views and a separate check-in area, concierge and lounge. Incorporated throughout each suite are a private outdoor lanai, upscale furnishings, modern full kitchen, washer and dryer, luxurious linens, flat-screen televisions, state-of-the-art entertainment system, complimentary high-speed wireless Internet access, elegant bathroom fixtures with deep-soaking tub, and rich woods and stone details. The resort’s new 5,000-square-foot pool, scheduled for completion in January 2009, will feature a waterslide, waterfalls and swim-through grotto terraces. The Grand Waikikian complements the surrounding 22-acre oceanfront resort of Hilton Hawaiian Village, which features more than 90 shops and boutiques and a diverse, international selection of restaurants. The Hilton’s beachfront Super Pool is the largest on the island of Oahu and transforms into a celebration of Hawaiian culture and entertainment on Friday evenings, culminating with a spectacular fireworks display. Hilton Grand Vacations Company, LLC is a division of Hilton Hotels Corporation, the leading global hospitality company, with more than 3,000 hotels, resorts and vacation ownership properties. The company owns, manages or franchises a portfolio of some of the best known and highly regarded brands, including Hilton®, Conrad®, Doubletree®, Embassy Suites Hotels®, Hampton Inn®, Hampton Inn & Suites®, Hilton Garden Inn®, Hilton Grand Vacations®, Homewood Suites by Hilton® and The Waldorf=Astoria Collection™. Headquartered in Orlando, Florida, Hilton Grand Vacations develops, markets and operates a system of high-quality vacation ownership resorts in select premier destinations. The company also operates two innovative club membership programs, Hilton Grand Vacations Club® and The Hilton Club® providing exclusive exchange, leisure travel, and reservation services for more than 140,000 Club Members.